Denver was definitely a neat opportunity that I won't soon forget. Being able to serve as Utah Beef Ambassador has taught me so much, and I have gained a lot of knowledge and experience that I wouldn't trade for anything. Before I become a Beef Ambassador, I always had a passion for this great industry and way of life, but while serving as an ambassador that passion has only been rooted deeper, and my desire to tell people our story stronger! I have been able to see just how important it is to get out there and help teach people what our industry is really about. It's unbelievable the things consumers hear about us today; that gap needs to bridged. Only 3% of the U.S. Population is involved in agriculture, so there is a lot of work to be done. I have been very grateful to have been given this unique opportunity to help do my part of advocating for the beef industry. I have enjoyed teaching elementary classes, helping at farm field days, and talking to consumers all to prepare for this competition in Denver. I would like to express great appreciation to all the amazing people who have helped me so much to train and prepare for this competition. It is because of the support of such great people that I have been able to represent Utah proudly. I would not have been able to get anywhere if it wasn't for them. The competition was a great experience, it was so much fun to be able to meet other youth from all across the country that share the same passion for the beef industry that I do. All of the contestants were amazing in their own way. I am extremely happy for those that were chosen to be on the 2015-2016 National Beef Ambassador Team. I know they will do great things for this industry! As for me, this competition taught me a lot, and though I may not be on the National Team I know that there are other places that I can utilize the skills I have learned from this experience. For example, I am excited to become involved in programs such as the 4-H and FFA as a leader to help encourage other youth to become involved in agriculture and to encourage them to continue to tell our story as the issues and challenges we face today will likely only get harder. I am so grateful that I have been given this amazing experience and truly hope that I will be successful in using the skills I have learned to benefit others in the future! I love this time of year, the fall colors are so beautiful. As summer comes to an end, I have been reflecting back on the great year we’ve had so far at the Elkhorn Ranch. We had a great calving season, which was an awesome new experience for me. I had the opportunity to help calve out the heifers at the Ranch. It was fun to see the new calves being born and to watch them grow. I learned that not getting attached to them is a lot harder than I thought it would be. And naming them wasn’t a good idea, but I did it anyway. The winter was a mild one and only had to face a couple of big snow storms. And yes Jason and Joe just happened to be out of town buying bulls on the biggest storm. It was a learning experience I won’t forget. I have learned that when you have cows that sometimes they don’t make it and you move on. After a few tears are shed, of course. Our hay crop has been abundant this year. And with all the moving of pipes and hard work it takes to get a great crop, in the end it makes it very rewarding. I decided to enter our first cut into the Cache County fair and won a blue ribbon. Life on the Ranch has been a new adventure for me. I was born and raised in Cache Valley. I grew up in Youngward. I was quite the tomboy as a kid. I helped my grandpa and dad with anything I could, as long as I could be outside. I also helped at neighboring farms during the summer. It’s something I became accustomed to love. So when I met Jason and I started helping out at the Ranch. I fell in love with it all. It is a great place of peace, but also hard work. I do many things to help out at the Ranch. Jason and Joe continue to teach me new things all the time. I’m grateful for the two of them in my life. The Fuhriman’s Ranch continues to grow every year. We now not only have horses and beef cattle, we also have chickens and ducks. We have a great time working on the Ranch together. It is fun for my two girls to help out, Heather my oldest daughter has found a love for all the animals and has joined the FFA at Mountain Crest and plans to show a steer at the Cache County Fair next summer. Hannah is my youngest, she loves the animals as well. She keeps us laughing. Working on the Ranch has made me realize how important it is to capture memories of our daily lives through photography. I started to get into photography a bit here and there a few years ago, but now it has become my passion. I always thought it would be fun to follow people in their daily routines and capture the time they spend with their families. I know many ranches and farms are ran by families that go back for generations. I know many of them don’t even think about taking photos while they are out working. But I feel that moment is a memory that should be cherished. The passion and love that ranchers and farmers have for what they do everyday is an awesome time to keep ahold of those moments. I’m always taking photos of all that we do. It is fun to look back through them and see all that we accomplish. I have really enjoyed being a part of the cattle community. 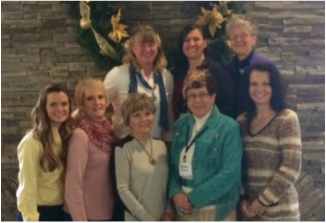 Being in the Cattlewomen’s Association has been a great opportunity for me to meet new people and make good friends. There are many great men and women in the cattle organizations and I look forward to working closely with the women in the Cattlewomen’s who bring a great light to the cattle industry. My life has been forever changed in the best way I can imagine, by being a part of Jason’s life and the adventures at Elkhorn Ranch. Summer Conference A Huge Success!! Summer Conference this year for UCA and UCW was held in Wendover, NV, on June 29-July 1st. It was a huge success! Don and Beth Anderson did a great job putting together the whole Utah Cattlemen’s Conference, and ReNee Mckinnon, president of UCW, did a fabulous job with our Utah CattleWomen’s general meeting, which was held on June 30th. In our general meeting we discussed how we are doing as an organization, discussed some current events, and heard reports from various committees, such as Membership, Farm Field Days, Cook-offs and Sam’s Club demos, WIGGY reports, Beef Ambassadors, Team BEEF, and more. For our activity we watched a movie called “Heartland”, and enjoyed popcorn and candy. This movie was a documentary about various farmers and ranchers who tell their stories. Afterwards, ReNee encouraged all of us to tell our own stories, so we had a wonderful sharing time afterwards and learned some things from each other. It was a terrific meeting! On July 1st, UCA and UCWA members headed to Callao to visit and tour Don and Beth Anderson’s beautiful ranch, and enjoyed a delicious dinner hosted by them on their ranch. We also learned that their ranch has an original building from the Pony Express, which we got to tour, and it has an adjoining museum with tons of history! Very fun! Thanks to all who had a hand in helping the Anderson’s, and ReNee Mckinnon, put on a successful summer conference for both . 1. GREAT COMPANY - gain priceless friendships and associations throughout the entire state! 5. GREAT FOOD – delicious dinners served….always including beef! 6. DISCOVER - what these men and women are doing for you to promote livestock and ranching, and preserve your way of life. “One year my husband and I decided to see what these conferences were all about, so we attended. We discovered that these men and women are doing amazing things for us! They are working hard to preserve and protect our way of life! They are very professional, very friendly, and stay at the top of their game with current events and hot topics. We have continued to go and support these meetings, because we learn so much, and have gained friendships that we will cherish. So glad we went! If you are a member of Utah Cattlemen’s, you as a spouse (wife), are automatically a member of Utah CattleWomen’s!? So be sure to come on in to the next meeting and feel welcome! If you’re not a member, come join us! Region 6 Meeting is going to be at Las Cruces, NM (with a free shuttle from El Paso), next Spring! April 29-May 1, 2016. Menn proceeded to organize his “Farm Trek 2015,” to take place during spring break. Twenty-three students from California, China, England, France, Hong Kong, Missouri, New England, New jersey, Pakistan, Singapore, and Washington D.C., who mostly knew about agriculture issues only from what they had read in the newspaper, traveled the two lane roads through Illinois and Iowa to visit an Amish farm and lumber mill, row-crop operations, a dairy, a honey operation, a hog operation, a cattle auction, a winery, DuPont Pioneer, Kinze Manufacturing, a Monsanto farm tour, John Deere Harvester Works and DISTek. A smaller version of this experience happens around our state, and our nation every year in the form of Farm Field Days. This effort is supported by banks, equipment companies, area businesses, government agencies, service and agriculture organizations, as well as individual farm and livestock producers. I am embarrassed to say that I waited 50 years to become involved in this effort. I thought I knew about agriculture and am amazed at the things I learn right along with all the third graders from Iron County Schools. This year I participated with other ladies from Iron County Farm Bureau to teach the kids about corn. Corn! I thought I knew everything about corn. But did you know that a corn product is an ingredient in batteries? Or that the heads of matches are often dipped in corn oil to keep them from igniting until they are scratched on a rough surface that removes the oil and causes that initial small burst of flame? And I had never seen popcorn popped off from an actual ear. As a treat at the end of our presentation, we put an ear of popcorn into a microwave and “Walla!” in about a minute the microwave was filled with fluffy white puffs that all the students could come up and try. Magical! Because we had one less group of students than stations for them to rotate to, there was one time slot that I had nothing to do, so I used this time to walk to the next station and see what was being taught. This happened to be a discussion on soils by Jason Bradshaw from the NRCS. First he held up an apple to represent the world. He cut out 1/4 of the apple and said that this was the land; the rest was ocean. Then he cut the ¼ in half and this represented mountains, deserts, and ice caps. The remaining 1/8 he cut into four pieces, one for land too dry and barren to grow much, one for swamps and wetlands, one for towns, cities, roads, and mines. From the last piece, he peeled the skin to represent the actual top soil that would grow crops. Only a small bit of 1/32 of the earth is available to produce the food needed to feed the world. This is a sobering thought, and emphasizes the need for conservation, technology and innovation to enable adequate sustained production. This year, Chad Reed from the Iron County extension office recognized the ten-thousandth child to attend the Iron County Farm Field Days. Just like the Harvard students, these Farm Day participants have the potential someday to be future producers, inventors, and policy makers for all of us. This summer we will attend (or will have attended by the time this article is printed) a Utah Cattlemen’s Summer Convention where livestockmen and women gather to learn about new methods and technology, better breeding lines, and to discuss challenges facing the livestock industry and possible solutions. Then, according to Charles Redd in the June newsletter, the Utah Cattlemen’s (and cattlewomen’s) Associations will respond aggressively to these issues. Whether introducing Harvard scholars or Iron County third graders to agriculture, raising soy beans or cotton in Arkansas, or being Utah Cattlemen and women in the West, what an amazing time to be involved in the agriculture industry. What an exciting, challenging, amazingly “fantastical” life to be a part of. AGRICULTURE, YOU GOTTA LOVE IT!!! Show, what a vision that was it had something for all of us. Lots of American flags were waving in the breeze as Mollie Beaver belted out the Star Spangled Banner, she won the singing contest sponsored by NCBA (well deserved I might add). She has a beautiful voice, hit all the high notes, and ranching has been in her family for generations. Eric Wahl, author of "Unthink" entertained us by painting on canvas while on stage the Statue of Liberty, a rendition of God Bless America was playing in the background. He talked about the fear factor. He ask what is a creative idea worth? Challenge unlock your potential. Cattlemen and CattleWomen put on you boot and hats and go tell your story to the world. Tell them about your great product, and awesome way of life, help the cattle industry to stand strong, take risks, stand up for what you are, and what you believe in!!! Develop an "elevator speech" about Beef, give it to the waitress, the barber, postmaster, cabdriver on the airplane or at church, on Facebook, Instagram or #Twitter. We need to be just as loud and creative as the people working against our Industry. The thing I enjoy most about ANCW is the association with the wonderful ladies that attend, the Executive Committee and Working Group Mangers work non-stop to promote the Beef Industry. We have made many wonderful friendships with members from all over this nation, we are there for each other. Kay Nelson from South Dakota lost her rodeo cowboy , cattlemen, husband in December, she said I had to come to convention to get some hugs from my CattleWomen sisters to get through the grieving process. The love and support for one another is incredible. Kay put me to shame by saying she comes to Salt Lake often and has her family tree traced back to the 1600's..
2014 was a banner year for our industry almost a perfect storm, NCBA officer received a text from a rancher in Tenn. stating he was able to pay off the debt on his ranch and his son was coming back home because of the great price he received from his calves. This was also a great year for ANCW, we participated in 202 Sam's Club Demo's, 2 Metro Cooking Shows, Mom's Day on the Farm, and 8.5 million hits on a Twitter Party. Dr Eng sponsored the Eng Grant of $14,000 to CattleWomen Sara linneen, Dr Eng was to the Session to make the presentation, he is going to award another grant for 2015 and beyond. Ladies this is an opportunity for each of you to gain some monetary support for your creative ideas to implement on your ranches. The presentation "Protecting Your Assets Beyond The Grief" was very eye opening, it is something we all need to do in order to achieve financial peace. We need to have a Living Trust in order to pass our possessions on to the next generation. The Roberts Rules of Order Skit, presented by the ANCW Executive Committee was very helpful to me. Needless to say I am on a real learning curve regarding parliamentary Procedure. They put in a clever humorous way. The presentation is on the ANCW web site(wwwANCW.org) if you have any need for this information. 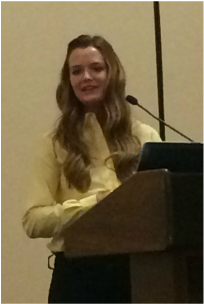 The keynote speaker for ANCW was the appearance of New York Times best selling author Nina Teicholz talking about her best selling book "The Big Fat Surprise " Why Butter, Meat, and Cheese Belong in a Healthy Diet. She said our Industry has really received negative publicity and frankly a really bad rap. And I quote from Financial Times,"This is a striking study...which may well change the way you eat. I, for one, won't ever hesitate to order a steak again." At our Winter Conference in Salt Lake, Melanie Fowle the new president of ANCW brought a copy of the book with her, she was raving about the positive slant for the Beef Industry. It is about time someone stepped up to be an advocate for our delicious BEEF!!! Recommended as "Rock Stars" from Utah were Nikki Weston , Jodie Reeder, and Beth Anderson these awards were well deserved all three of them have gone the extra mile this year to make the Utah CattleWomen's projects successful. Hats off to our Utah Rock Stars. Receiving Platinum Spurs from ANCW were Beth Anderson and ReNee McKinnon, thanks to all of you for joining ANCW and to all of you renewing your membership. The Platinum Spurs were treated to a Beef Buffet sponsored by Certified Angus Beef, thank you! Powder River has been a great supporter of ANCW and the Utah CattleWomen, the Powder River Banner was proudly displayed in all of our meetings. If you come in contact with any from Powder River this be sure you thank them for your support. The Utah Delegation sat together at the Cowboy Comedy Club, we enjoyed the fabulous magic tricks, Baxter Black, and laughed our heads off with Jim Foxworth. We clapped our hands when Randolph' s own Wade Stuart won the Best Mustache Contest. Best part of the evening was visiting with LeAnn Fox (our Beef Ambassador), Joseph and Jency Weston, Jordan and Jennie Willis. The energy and enthusiasm of these wonderful young ranchers is incredible. The Utah Cattlemen and CattleWomen really need our young people to be involved, hats off to the Utah Cattlemen for funding the Weston's and the Willis' way to Sizzling San Antonio. What an incredible week we had, we were educated, energized, and entertained, as awesome as it was last Monday morning I was so happy to be back home, hop in the army truck, pull the bale stings (we need to find a way to recycle them), help load the Kirby Feeders so James, Jed, and Jordon (my handsome nephews) could feed the cattle. The plan is prepare my elevator speech, get my boots on the ground and declare, what's for breakfast, Lunch, or Dinner, LET IT BEE BEEF!!! Region Six Meeting Tucson, Arizona April 29, 30, May 1. As a sixth-generation rancher, I quickly learned that raising beef cattle was more than just the way we earned money. My love for the land and our livestock was inborn. The values my father passed on encouraged me to pursue an education in agriculture and be the family owned voice much of the world has forgotten exists. My experiences being the 2014 Utah Beef Ambassador have made me aware of issues cattle producers cannot resolve on their own. I feel very fortunate to have received this opportunity to educate Utah’s young and old about beef, and in my opinion, this is the best time in the world to be an ambassador for such a good organization. I went to many elementary schools and listened to what the children already knew about beef, and then taught with fun presentations such as Beef Gives You ZIP. I went to the state fair, Sams Club, and the Southern Women’s Expo talking to consumers about the health benefits of beef. I had multiple interviews with Utah State University, and one with the Cache Valley Media Group. My favorite experience was going to Denver to compete against many other state beef ambassadors at the national competition. Here, I gained high hopes for the beef industry. If the future has those bright students in it, the cattlemen have no need to fear. I am now serving as the spring NCBA public policy intern in Washington, D.C. I know if it weren’t for the Utah Beef Ambassador program, I would not be here. Upon completion of my four year degree at Utah State University, I intend to actively promote beef through the communications field. I would like to thank the Utah Cattleman’s Association for the opportunity to be the ambassador and for aiding me in my education. I am so grateful for the experiences that will benefit me as I achieve my goals in sustaining and promoting growth in the beef industry. Wow! What happened to 2014? It seems like only yesterday that I agreed to take on the office of president elect of the Utah CattleWomen’s Association. After all, there was a whole year to prepare. I attended the beef industry meetings in Nashville, where I learned a lot. The Region 6 meeting in Lake Tahoe put me on a new learning curve. The summer meetings in Denver were very motivating, and the Utah summer meetings in Park City helped me understand more. A whole new perspective on things emerged after the election took place last month. The buck stops here now, and that is really terrifying. I recently had the opportunity of reading and scoring nineteen applications for the Eng Grant. This grant for $14,000 was given to ANCW to present to one of their deserving members. This was an incredible opportunity to learn about the hopes and aspirations of cattlewomen across this great land of America. All of them loved our unique industry, their land, cattle, and their families. One of the applicants mentioned how a fellow member of University of Arizona Livestock Judging Team had taught her to embrace her awkwardness and how that changed her life. I hope that I can embrace my insecurities, and inadequacies, and thus embrace the Utah cattlewomen from this applicant’s example. Thanks to Beth Anderson for being such a great mentor. No one could have done more than Beth. She hugged more, cared more, texted more, snapped more photos, pushed more, pulled more, reminded us more, and loved us more. Thanks to Deb Richards for great ideas, helping with the Beef Ambassador Program and the races. Thanks to Jody for always going the extra mile with decals, farm field days, and auction items. Thanks to Julie for the great auction basket and your wonderful smile. Your enthusiasm always buoyed us up. We appreciate Diane Weston’s ability to keep us going in the right direction. She knows more about the cattlewomen than all the rest of us put together. This was a great team and I thank all who helped in so many ways. Cattlewomen could learn some great lessons from geese. As each bird flaps its wings, it creates an "uplift" for those following it. By flying in a "V" formation, the whole flock adds 71% greater flying range than if each bird flew alone. The lesson is cattlewomen who share a common sense of direction and sense of community can get where they are going more quickly and easily when traveling on the trust of one another. Whenever a goose falls out of formation, it suddenly feels the drag and resistance of trying to fly alone. It quickly gets back into formation to take advantage of the "lifting power" of the bird immediately in front. If cattlewomen have as much sense as a goose, we will stay in formation with those who are headed where we want to go. Melanie Fowle, president-elect of ANCW is a good example to follow. When the lead goose gets tired, it rotates back into the formation and another goose flies at the point position. Cattlewomen take turns doing the hard task and sharing leadership. Cattlewomen, as with geese, are interdependent with each other. The geese in formation honk from behind to encourage those up front to keep their speed. We need the "honking" from the cattlewomen to be encouraging, and motivating. When a goose gets sick, wounded, or shot down, two geese drop out of formation and follow her down to help and protect her. They stay with her until she is able to fly again. Then they launch out on their own to catch up with their flock. If we have as much sense as the geese, we will stand by each other. The Utah CattleWomen need you and your talents. As the new president, I really need all of your support. You might also need the love and support of other cattlewomen. Thanks to all of you for attending the breakfast at convention, where we had a full house. It was terrific! Thanks to Wendy Jo for the incredible book for Beth, and the other fantastic books she caught us up to speed on. One of the highlights at the convention was learning how to make bread in an hour. This demonstration was presented by Pantry Secrets. They also did mini cinnamon loaves for table favors at the breakfast. Big thanks is in order for them. I am looking forward to working with the newly elected cattlewomen's board. They are as follows: Deb Richards, president-elect; Leann Fox, Carrie Kirby, and Maria Smith, 2nd vice presidents; Marcea Nielsen, secretary/treasurer; and Beth Anderson, membership chair. I look forward to an incredible 2015 for all of you.